We began with some presentations on techniques for orienting ourselves in complex problem space before embarking on the workshop. RISCS Director Madeline Carr provided an overview of approaches dealing with uncertainty that are emerging from the policy community. NCSC has researched around orienting in problem space and complex problem solving. She also provided an overview of the Cynefin Framework which highlights some of the risks of treating complex problems simply. David Tuckett is a psychoanalyst, economist and sociologist. 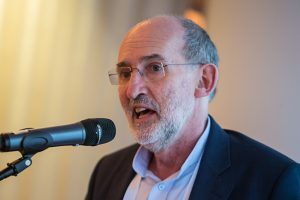 He works as a clinician, as a Fellow of the UK Institute of Psychoanalysis and also as Director of the Centre for the Study of Decision-Making Uncertainty and Professor both in the Psychoanalysis Unit and the Department of Science, Technology, Engineering and Public Policy at University College London (UCL).